1. Take the Van Emburgh Avenue exit. 2. Go through three lights, passing Demarest Farm on the right. 3. Make the next right turn onto Werimus Road. 4. Bear left while on Werimus Road. 5. Travel approximately 1 mile down the road, Galaxy Gardens will be on the right side. 1. Take the East Allendale Ave. exit towards Saddle River. 2. Go over the bridge and continue on East Allendale Ave. (past the school). 3. Bear left, looking on the right for Woodcliff Lake Road. 4. 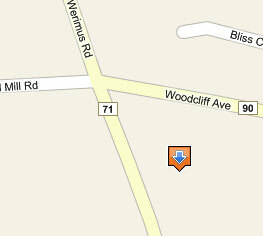 Make the right at Woodcliff Lake Road and go up the hill. 5. Go through the light, bearing left. 6. Make a right onto Saddle River Road. 7. Go to the end and make a right onto Werimus Road. Galaxy Gardens will be on the left, at the corner of Werimus Road and Woodcliff Avenue. 1. Go to the second light past Tice's (Glen Road). 2. Make a left onto Glen Road. 3. Continue on Glen Road approximately 1/2 mile to Werimus Road and turn right. Galaxy Gardens is approximately one mile down the road on the left, at the corner of Werimus Road and Woodcliff Avenue.